Sorry for my English, non native speaker still learning. Hey man, I really apreciate your work, you have teached me a lot about charge blade optimization. 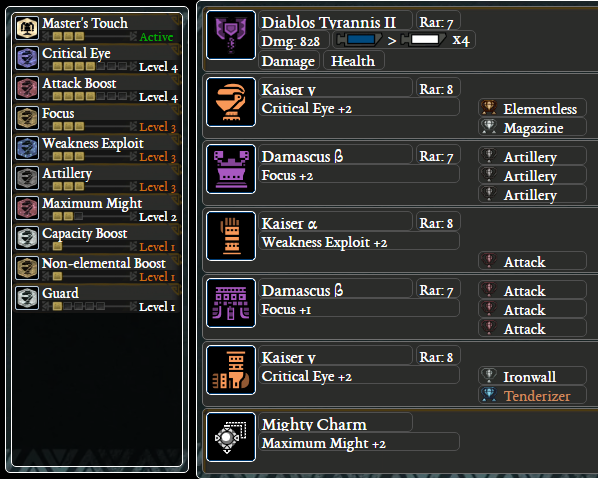 I’ve starded to farm behemoth to get the only decoration my build is missing (capacity boost) and I would like to know if you are planning to make an anti extremoth build. 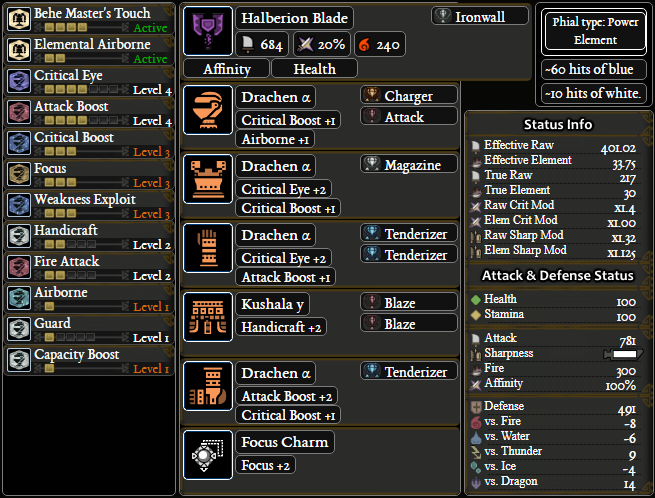 I would love to know your opinion about evade extender, health boost and tool specialist when facing extremoth. When the event comes, hopefully I’ll have my magazine jewel. Thanks again for all the builds man, you are doing everyones life easier. 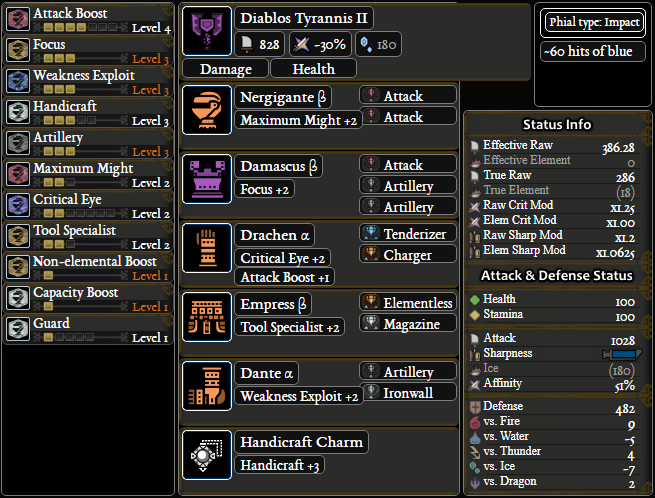 I personally did not use CB for hunting extremoth so I’m not sure how much advice I can offer (I used hbg tank build with glutton hbg as the aggro taker). I think you definitely should use health boost 3, guard up, and guard 3 or even 5. I would even consider divine blessing or defense augment on weapon. FYI I don’t think behemoth is great for farming decorations. 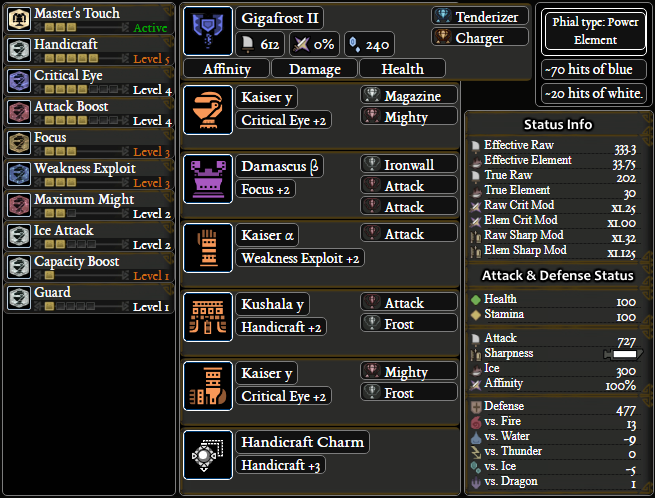 your best bet is probably tier 2 tempered monsters with 3/4/5 rewards or the arch tempered jagras event plus melding. Thanks for the fast reply man, Sorry I noticed one month later but I don’t understand much about how this sites comment section work. Its been a month or so since I asked you my question and I have done a lot of testing with Behemoth. Thanks to rngesus I now have 3 magazine jewels so now I can test all of your builds and they are awesome. I have them all saved in my loadouts and they are really usefull. You are right, Behemoth is a bad monster to farm, but thanks to him I got the 3 magazine jewels and all the decos on the game and the fight is fun so I don’t regret choosing to farm him instead of T2 tempered monsters. I even managed to solo Extreme Behemoth. 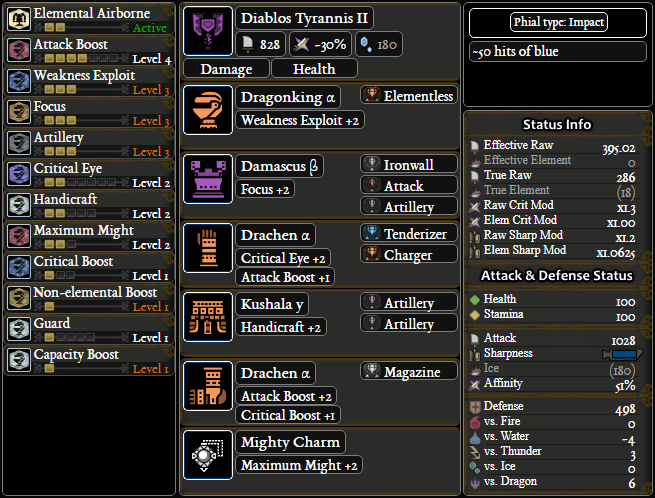 Anyways, there are still some matchups that I had to make different builds because of the Monster shenanigans, like Lunastra and kushala i always need windproof 5 or Kush armour to not cart against the nova or not be blown away by Kushalas wind aura, or Xenojiva where i need heatguard to not melt in the lava poodles, or Vaal hazak where effluvia resistance 3 is mandatory. I would love to see the sets you use for these troublesome monsters. As usual, thanks for your efforts. You are doing gods work. 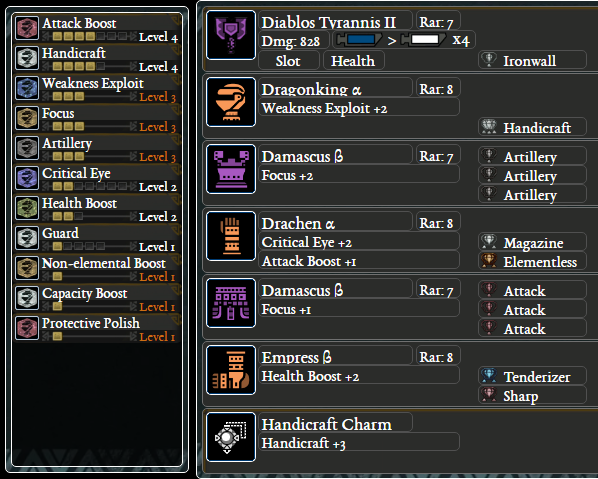 If I have 3 artillery decos but no attack decos, I can go with the attack charm and art decos instead right? I agree. While Power Prolonger may be a net DPS loss considering the alternatives, I think it’s a worthwhile cost for the “convenience/comfort” factor. Less time micro-managing timers and more time with your attention on the fight. Still, I wouldn’t grab it unless I had it in decorations and I had plenty of slots to spare. Are there any plans to update the guide with the new CB’s from AT Kulve? Ice is obviously good, but are any of the others worth grinding for? Thank you for the great work, looking forward to the update! It would be very helpful if you could also provide an expert opinion on which monsters would be optimal to hunt with which CB. For example, my short research shows Ice CB may be optimal for Kirin over the Fire one, due to significant jump in elemental power, compred to hitzone elemental values on Kirin’s head. In any case, your work is greatly appreciated! Just a heads up, the Water (Taroth) build will be PC too from January 4th. Haven’t played the game for months and this is what I had. 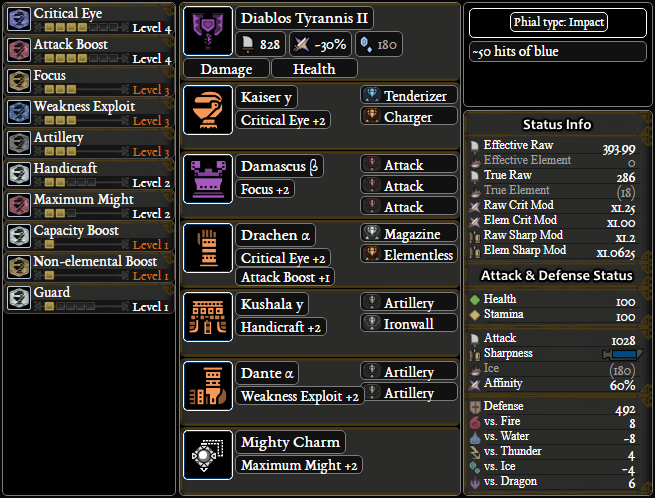 Been trying to farm Tenderizer and Magazine but no luck so I can’t start doing the transitional poverty builds. can’t recommend since it doesn’t have focus 3. I’d just use the first poverty build on this page. for the anti-luna builds, what does guard up actually do ? 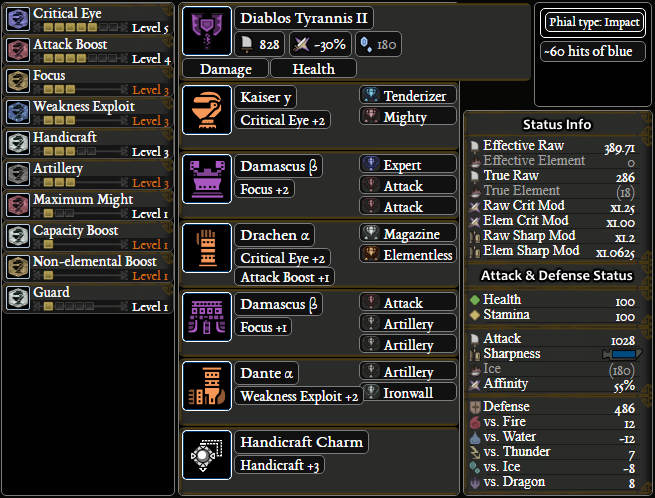 Is it worth it using something like Devastation’s Thorns for the elderseal skill? Will there be any update on the PC version once the Kaiser Gamma is released? 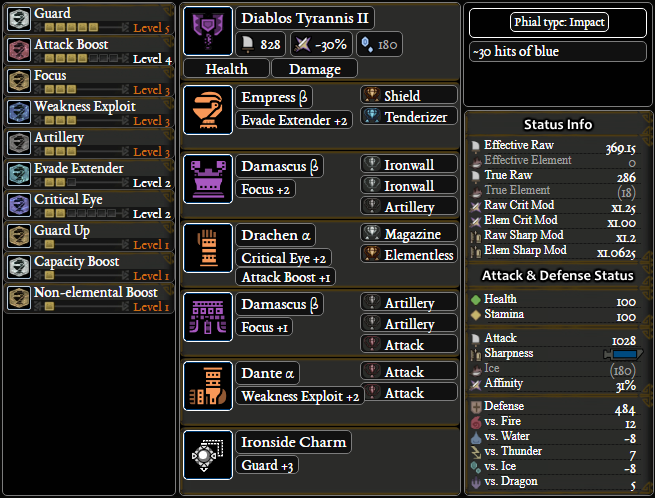 Q2: Do you prefer white sharpness over Critical Boost for more elemental Phial damage? Which one is better? 2. Are you sure? I thought, I saw different phial damage numbers on monsters per SAED. So some phials do crit and others not – and therefore the criteria boost does have an influence on those phials. what you are seeing is not phials critting. Elemental phials are affected by hitzones (unlike impact phials which are fixed damage) so they will hit different damage on different monster parts. 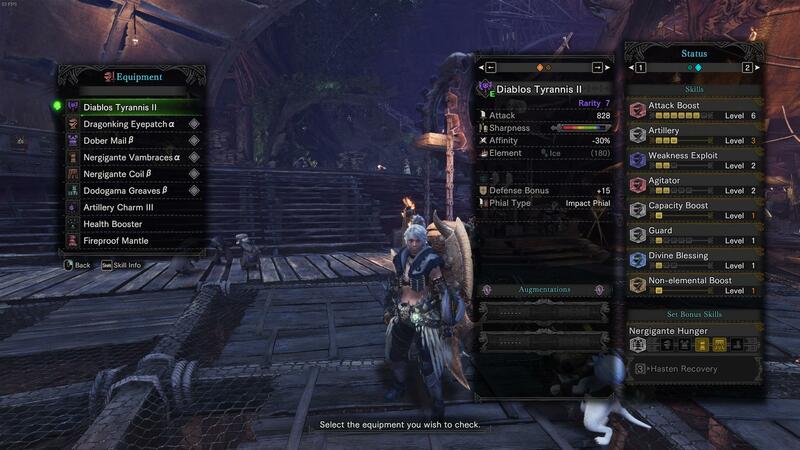 Charge blade phials cannot crit (but switch axe phials can). 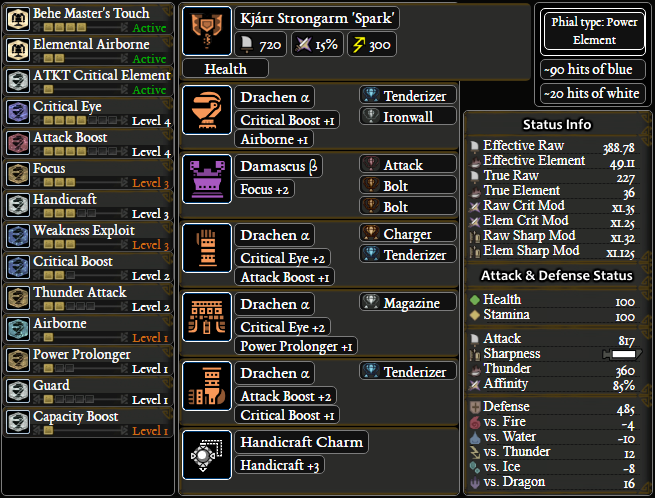 I’m not going to change my antikulve build based on my experiences fighting kulve but you are free to swap weakness exploit for something else. Doesn’t seem to be listed in this site. Looking forward for the Gala armor update on 26! Do you think there will be changes? 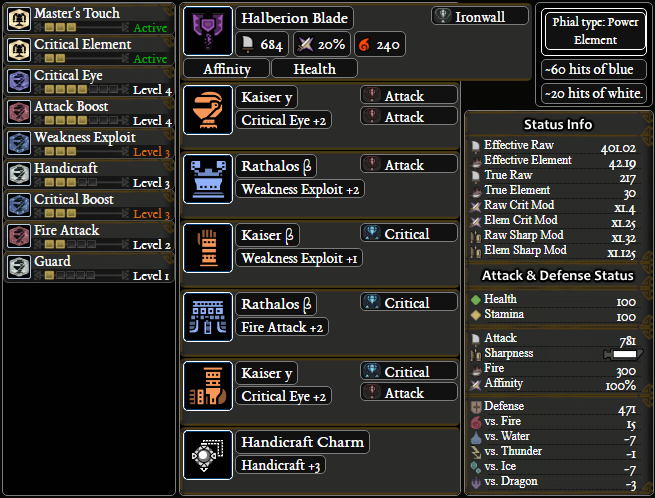 You my friend, are the creator of the MHW CB Bible, where ever I go and see people looking for CB builds, the link to this is followed soon after. Thx 4 your Work Buddy. Apreciate that a lot! First and foremost, props to Stripedypaper for this really useful guide. I play on PC and, so far, I’v found only one attack deco (besides the one given during the quest) and 0 charger decos. Do you think this build is good enough? Soon AT kushala will be released on PC; kushala y arms is identical compared to damascus b chest. Is it possible to switch drachen arms and damascus b chest and use kushala y arms and anothet chest (I can’t figure out which one)? You are wasting one Level 3 slot, use mighty jewel instead of expert for 5 percent more affinity. Hello there, thank you so much for your help for all CB players. I’ve bookmarked this and reference’d it everytime. 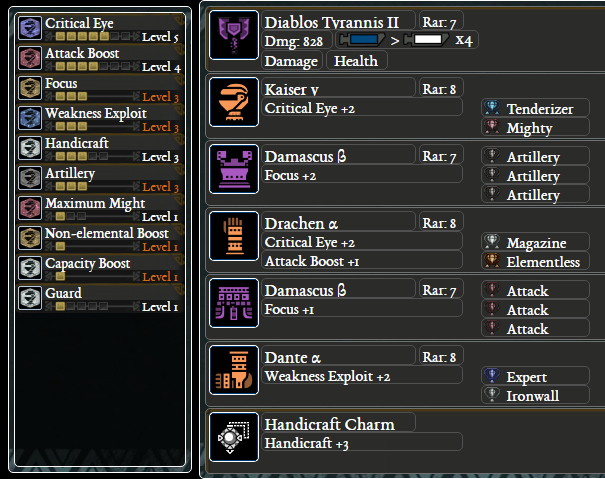 Question: Is there an alternative for All-purpose Handicraft Build due to Dante Set being event item only? Would be greatly appreciative. Code red will be out again on Jan 26, 9am JST. Hello, Isn’t the drachen armor an event reward? The gloves are listed for it under the ALL-PURPOSE FLEXIBLE CHARM (NO EVENT EQUIPMENT) set. Thanks! I play on PC btw. Use a mod. Buy some artillery jewels. Quick question. Which do you prefer? Master’s Touch or Razor Sharp? Why the variant of the elemental sets are just “variants”? They have more EFR. 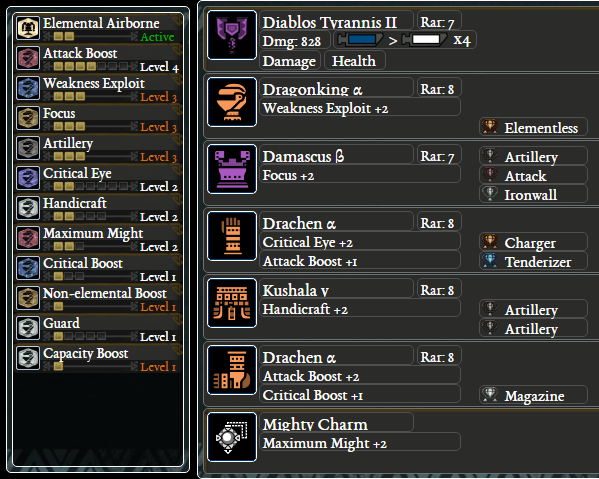 the drachen variants trade 1 handicraft and 1 elemental attack for more efr. I decided not to create a separate entry for them. 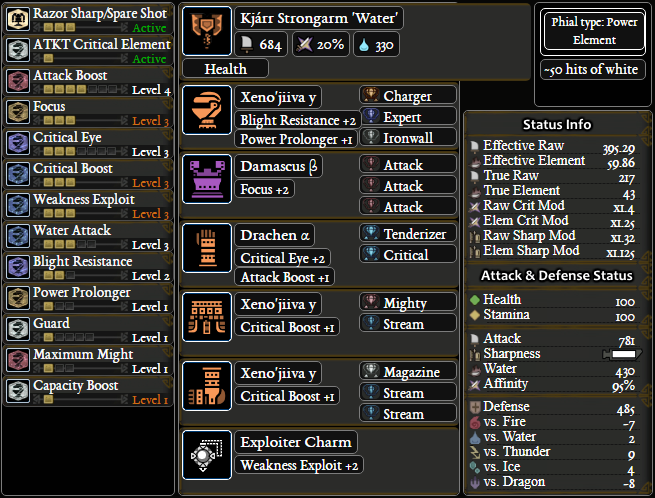 For the Kjarr Water build, you can get the same build with Kaiser Gamma instead of Drachen and have much better Fire Res for stuff you would actually use Kjarr Water with like Teo/Lavasioth/etc. Hey! First off all thank you a lot for creating this site. I instantly bookmarked it. Question: What would be the best way to build a PC alternative for the Critical Styx build? artillery doesn’t work for elemental phials (they use the corresponding elemental attack skill instead). 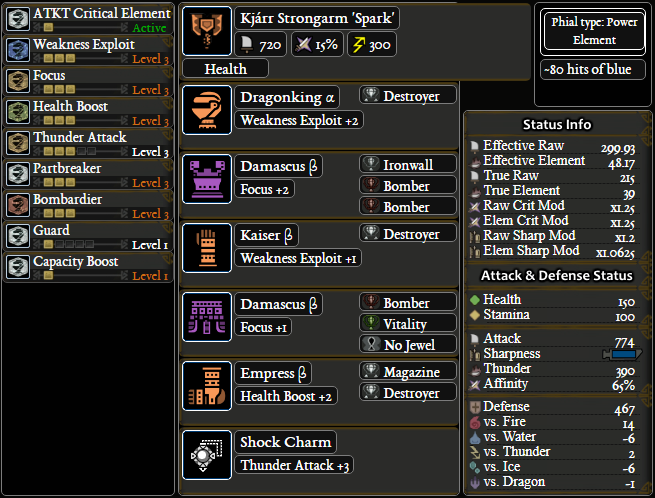 Critical element also doesn’t affect phials since they don’t crit so it’s just a nice to have effect that isn’t worth sacrificing behemoth set for. 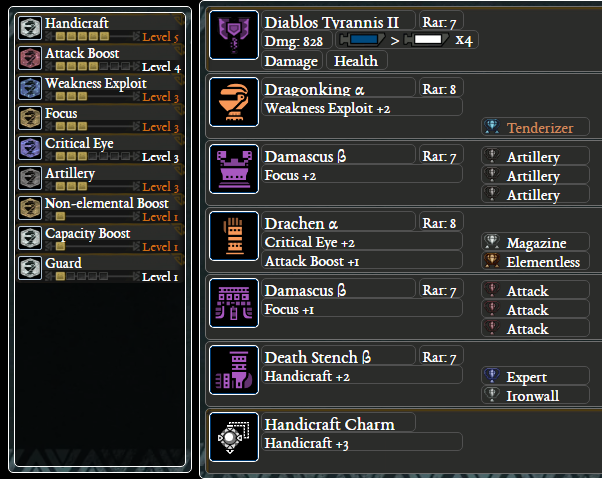 i think it’s better to have lvl 3 crit boost than lvl 4 handicraft. 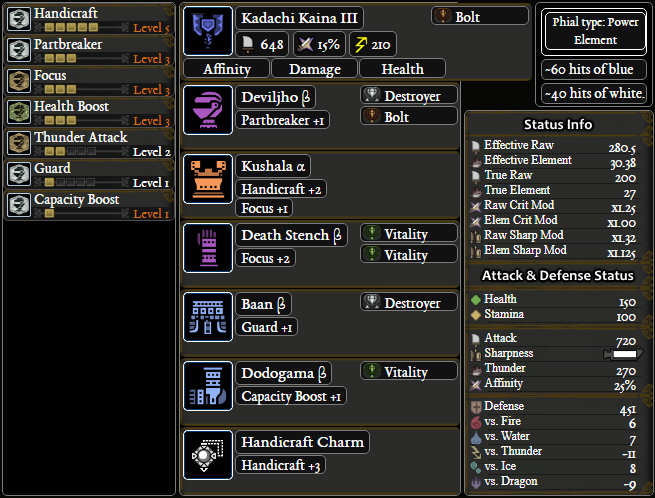 For all the CB players who struggle with AT Daora like I do, here is a build that allowed me to solo it after two multiplayer runs. 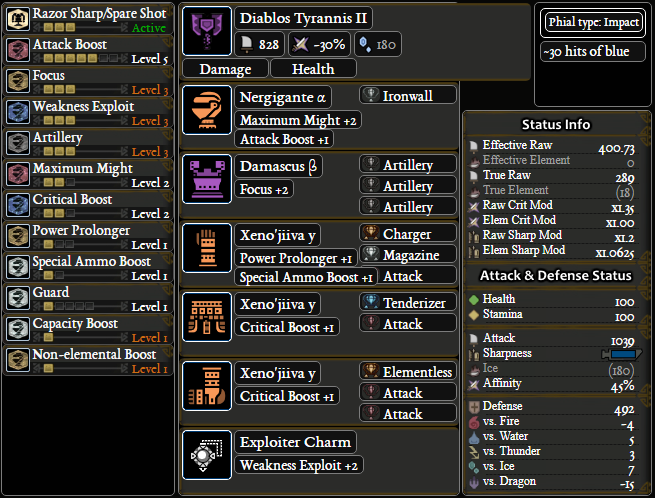 Hi, just started working on my chargeblade and everyone seems to recommend diablos tyrannos ii. 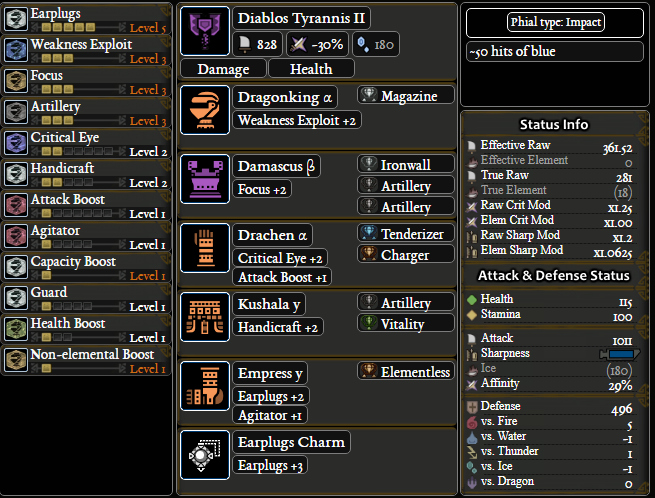 I recently acquired Taroth Strongarm “Horn” and it SEEMS like it’s the same as Diablos but with more defense. Is there an obvious reason why diablos is better? Thanks! So I’ve not gotten a magazine gem or a guard gem or an artillery gem, but I’ve got all the pieces for the handicraft build and other things, like the flexible build with no event equipment… At the moment I have Teostra gamma helm in place of the dragon king patch, etc. 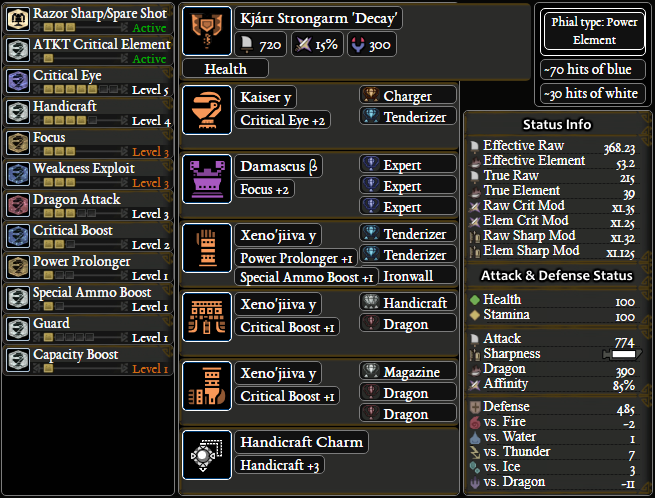 The artillery charm is definitely what I’ve got lately, but is dodogama beta capacity boost and guard +1 from uragaan beta leaving a heap of damage on the table? I’ve been augmenting pieces like mad and am trying to triangulate, as it were, to avoid burn out. Is it better to roll with the poverty build pieces then do without those skills? 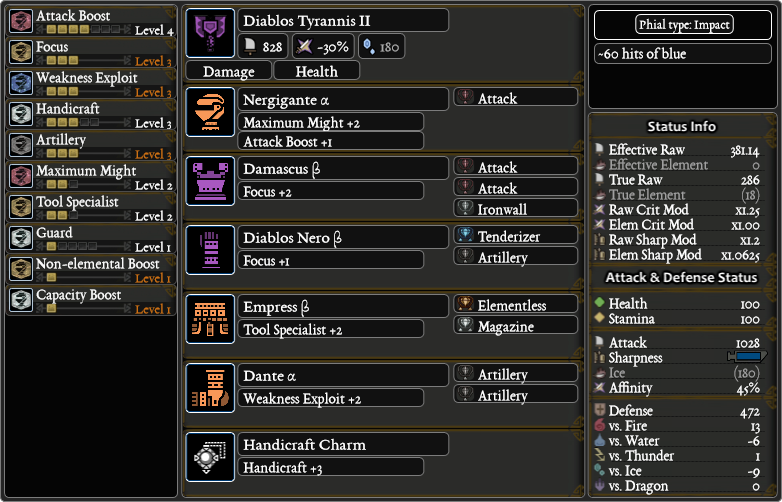 Hey, can you rate/examine/improve my build?